Aokigahara is a real forest located in Japan (often called the demon forest) where a large number of people go to commit suicide each year. 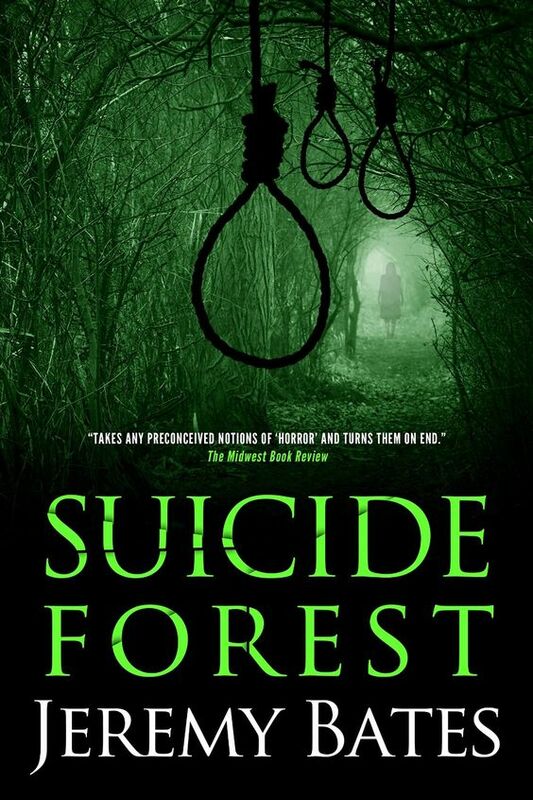 Jeremy Bates has chosen this location as his setting for the aptly named Suicide Forest, part psychological thriller part horror novel. I've always been fascinated by this place, and some of you might remember Aokigahara was mentioned in my review of Atlas of Improbable Places - A Journey to the World's Most Unusual Corners by Travis Elborough and Alan Horsfield last month. Well, reading about the place in the Atlas is what prompted me to bump this book up the list in my TBR pile and I'm so glad I did. From the blurb alone, you might be expecting a B grade thriller without substance, but you'd be dead wrong. I was on the edge of my seat the entire time, and the sense of foreboding was as palpable as if it were written by the pen of Stephen King. 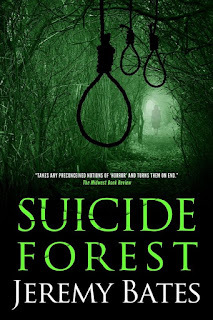 The forest and the geography of the landscape is the most haunting element of Suicide Forest, and what happens to the young tourists who visit to check it out gives the reader definite cause for concern. There are also many light moments to offset the grim and frightening surrounds and the dialogue between the tourists often had me chuckling aloud. Suicide Forest is the first novel in the World's Scariest Places series by Bates and is a ripping read. I encourage those who may not read from this genre to ignore the cover and plunge right in. I enjoyed this one too when I read it a while back. I really want to get my hands on Island of the Dolls by the same author. Such a great idea to write a horror series based on real-life scary places! Great to hear you enjoyed it too. The Island of the Dolls place was also mentioned in the Atlas book I read. Let me know when you read it and if it's as good as Suicide Forest.